During the teaching today, the Gyalwang Karmapa gave the monks the oral transmission and practice instructions for the 8th Karmapa Mikyö Dorje’s Four Session Guru Yoga, the practice recited over loudspeakers across the Garchen last thing each evening at 10.00pm. First, however, His Holiness read a short section from Mikyö Dorje’s text, continuing the instructions on how to increase bodhichitta. The whole chapter can be understood as an extensive Guru Yoga practice, with a visualisation of the gurus in front of you, and continuous supplication of them. Within this section, the instructions on tonglen meditation continue. By the blessings of the Guru and your own compassion, visualise that all the happiness and virtue you have exits on the out breath and transfers to all other sentient beings. Then, as you breathe in, you inhale their suffering in the form of black smoke. First you visualise this happening to those you feel close to, your parents, family and friends, gradually extending the circle of your compassion to include those in the wider society you belong to, until finally you are giving away your virtue and happiness to all sentient beings and taking their suffering upon yourself. At the end, you visualise that all the gurus dissolve into you, and you become a buddha blazing in splendour. The subtle light from your body pervades all the universes, bringing all sentient beings to buddhahood. Imagine that the sources of refuge melt into you, and then rest in equipoise. If a thought arises at this point, begin the tonglen meditation again. In this way, ensure that whatever you do becomes mind training. Recognise anything not on the path to enlightenment as delusion. Whenever you have either physical or mental suffering visualise that you are taking on the faults of all sentient beings. Whether we feel attachment or aversion to others, we should always cherish others more than ourselves. We can check whether our practice of tonglen is successful or not. When training in bodhichitta, if we still feel hatred for those who have wronged us or if we are still attached to prosperity, it is a sign that we have not been training our mind correctly. If bodhichitta fails to arise, it is a sign we are training poorly. If we have a temporary wish to cherish others when we are meditating, but then afterwards we are only concerned for the purposes of this life, it means our mind training is not stable, like a field of young shoots destroyed by frost. The Gyalwang Karmapa advised that if any of these faults occur we should confess them through the four opponent powers of purification: regret for the action, reliance on the objects of refuge, applying the antidote, and resolving not to repeat the action. We need to practise gathering the two accumulations and purifying the obscurations. In particular, we should practise Guru Yoga with great fervor. The Gyalwang Karmapa then gave the oral transmission of the Four Session Guru Yoga and gave detailed instructions on the visualisations which accompany this practice. He also discussed the role of the Karmapas. In his summing up, His Holiness made some important general observations about samaya and devotion to the guru. 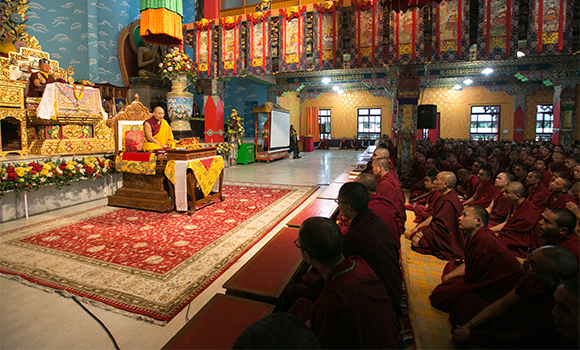 He spoke about the importance of maintaining samaya—the sacred bond created between a guru and his or her students during empowerments—and linked the problems which had arisen within the Kagyu during the last two hundred years to the many violations of samaya. These violations of samaya are the greatest enemy and the greatest obstacle, he warned. If there are infringements of samaya, we need to recognise the faults, confess, and make the commitment not to repeat them in the future. His Holiness then raised the question: What is an authentic guru? Firstly, we need to look beyond appearances. When Naropa, a high-caste prince, first met Tilopa his guru, Tilopa was in the form of a low-caste fisherman, drying fish on the riverbank. If Naropa had rejected Tilopa at that point, there would never have been any Kagyu! Whatever the guru does, it is important not to develop misconceptions. It has been said that we should observe a guru for up to twelve years to check whether they are authentic or not. This does not mean checking them for faults, but primarily assessing whether they have qualities or not. But once we have made a commitment and begun to serve the lama, even if we find faults, it is important not to break samaya of body speech or mind with them if we want to follow the path of the secret mantrayana. This is extraordinarily difficult because if your guru is an authentic guru anything you do which does not conform to the dharma is breaking samaya. 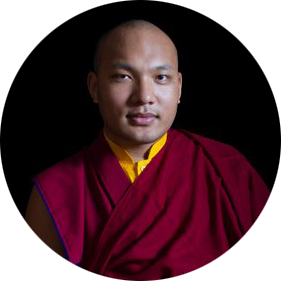 We are all dharma friends here, the Karmapa continued. We are gathered together in a single mandala and we have all received empowerments together. When minor things happen we should be prepared to forgive. Whatever our dharma friends do, we need to recognise that, from one aspect, it is our own fault, the result of bad karma we have accumulated from something we did in the past. Consequently, when we recognise them as our fault, it is unlikely that we will break samaya. Samaya is an extremely special connection between guru and disciple, which can lead to the transfer of an authentic guru’s realisations to the disciple, if that disciple has unbearable, uncontrived devotion and faith. Devotion in Tibetan is mö-gu. Mö means ‘longing’ and gu [pa] means dedication. We need to please the guru, by making offerings—practice, service, and material goods—but best of all is to always obey the guru’s command and accomplish their wishes.